Many industrial processes require custom water to water heat exchangers to perform a crucial role in the design, operation and maintenance of heating systems, air conditioning, humidification, water cooling and condensing plants, power generation, refrigeration, chemical processing, offshore oil rigging and industrial engineering systems. They are also important for process cooling and waste heat recovery in pharmaceutical, food processing, water treatment, textile manufacturing, pulp and paper and steel manufacturing processes. In addition, water to water heat exchangers are especially useful in marine heating applications in which the two main uses include integrating the engine’s fresh water cooling system with the hot water heating system and heating domestic water for uses in the galley and shower. There are different types of heat exchangers that are chosen according to the intended application. However, the most common design for water to water heat exchangers is a shell and tube design. In a shell and tube design there are two separate tanks of water: one tank is reserved for hot water, one tank is for cold. The water from each tank is pumped into a dual chambered reservoir that holds a series of tubes. The two chambers are separated by a thin layer of highly conductive metal, known as a tube wall, which acts as a conductor between the two fluids. The heated solution flowing on one side of the metal wall transfers its heat through the barrier to a cooler solution flowing on the other side. Thermal energy only flows from the hotter to the cooler in an attempt to reach equilibrium. The surface area of the tube bundle affect speed and efficiency, and the tubes can be plain, finned or longitudinally finned, and tube diameter, thickness and length should also be taken into consideration. Water is continually pumped through the system to maintain a steady exchange of heat. 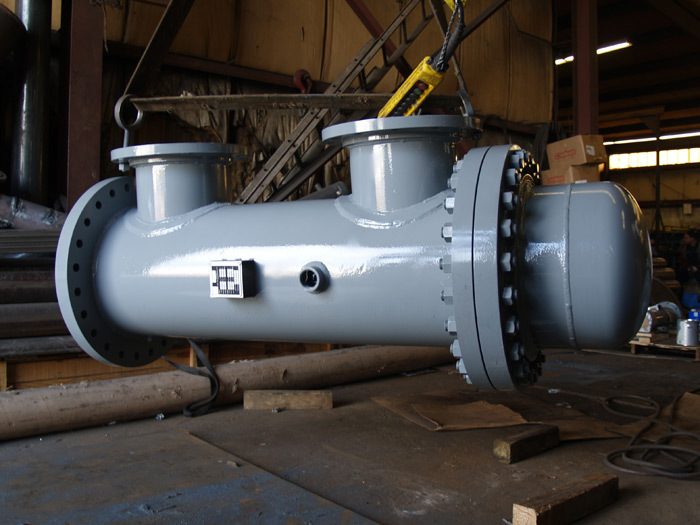 Water to water heat exchanger manufacturers typically construct exchangers from corrosion-resistant conductive materials such as steel, titanium, copper, bronze, stainless steel, aluminum or cast iron. 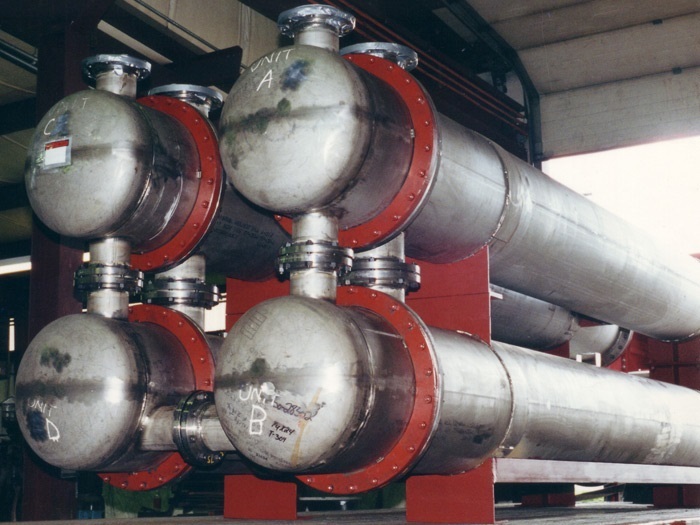 Water to Water Heat Exchanger Water to water heat exchangers transfer heat energy from one liquid to another without bringing the two liquids into direct contact in a similar method as air to air heat exchangers. Typically with a shell and tube or spiral design, water to water heat exchangers work through forcing hot fluids to flow through heat-conducting tubes over which liquid coolants flow. The heat is absorbed by the coolants and thus removed from the water, dropping its core temperature and allowing it to move on in its process.